I have a lot to talk about from my voyage to the east side of the USA. But right now, I want to share some photos. My home for 4 days. I straddled Lilly Ledbetter getting to my seat. Yeah. UMD had these amazing Brita water bottle fill stations! These should be everywhere! So yeah, there are some pictures for ya'll. I have a few things that I need to address from the trip. First of all, DC is amazing. I'd never been there before. We walked and walked and walked, I wish I had turned on the GPS on my MapMyFitness app, just to see how many miles we had walked. Alas, I didn't. Anyway. I can't explain how many cold chills I got thinking about the history of DC. I loved it. I'd love to live in that area someday. It's so busy. Helps me anxiety in a weird way. It's like, I go to shop at the mall, and it's sorta busy, so my anxiety goes crazy. It's like DC was SO busy that my anxiety got so high and looped back around to calm. People with anxiety, you will understand this phenomenon. Secondly, while three of us went to visit DC, one person from our group stayed for the opening sessions of the conference. We watched Twitter while we were gone, and whoa. The conference had a nice hashtag going, and jesus christ. The things people said. That feminism is sexist and archaic. That women shouldn't be in the front lines in the military because men were born to protect and defend women. Then this picture surfaced on Twitter. This is more than infuriating. We were in our taxi with Malik at this point, who I fell in love with but that's beside the point. The three of us were so speechless that the words that came out of our mouths probably sounded like jibber jabber. Tasha and I were talking later in our silly dorm room. What did I say? These women wouldn't be in college if it wasn't for the feminists who fought for them. 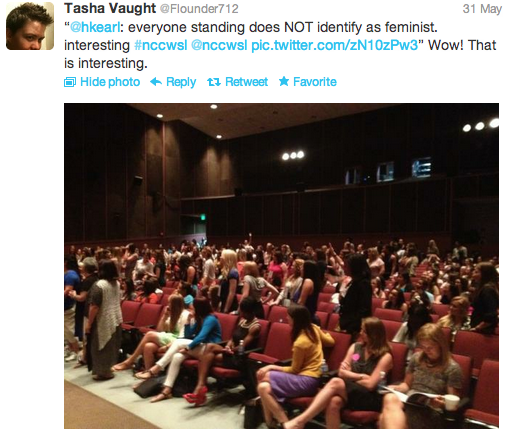 They wouldn't be at an all women's conference if it wasn't for feminism. This left me uncomfortable thinking about the workshops the next day, and brought lots of negativity into my mind. Do I belong around these people? Thirdly, the airplane seatbelt situation. On this trip, I was on 4 different planes. Talked to 4 flight attendants asking for a seatbelt extender because their seatbelts are not made for me. Two of the attendants were women, and two men (and I can be stereotypical and assuming that they were gay with their cute little lisps). The women were very secretive with the seatbelts, whispering and hiding the extender when they gave it to me. As if I was or should have been embarrassed that their seatbelts didn't fit me. It made me feel stupid, it made me feel unwanted on the plane, which many fat people already feel before even getting to the airport. The men? The complete opposite. They weren't whispering, they were happy to give me them, they didn't think it was embarrassing and they were friendly to me. There's something there, I just can't put a finger on it. So yeah, there ya go. Let me know what you think in the comments! I came across it a few days ago and it has some nice information about flying safely and fair prices.